Americans have many icons. But those dealing with the exploration and expansion of the United States seem especially beloved: stagecoaches, steamboats, trains—and the railroad caboose. From the mid-19th century through the last decade of the 20th century, the “little red caboose behind the train” has had iconic qualities similar to the little red schoolhouse, being the subject of songs, books, and toys that remain popular today. So what’s the caboose, and why has this icon largely disappeared from the national railway network while staying culturally relevant? 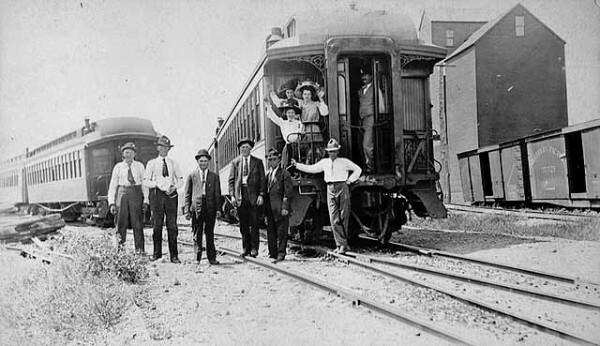 A postcard showing men and women standing on and by a caboose, circa 1908. When railroads emerged in the U.S. in the 1830s and 1840s, cargo-carrying trains were exceedingly short, handling only a few cars. By the 1850s, locomotives had become more powerful, track structures stronger, traffic increased, and individual railroads longer. Something more was needed to keep the trains on track. The engineer, fireman, and brakeman remained in the locomotive. But what about the conductor, “the captain,” who had legal authority over the train? And the one or two additional brakemen who helped to manage the primitive hand-braking system and throw switches as cars were picked up and set out? The caboose provided a shelter for the conductor and brakemen along with a heating/cooking stove, seats, and make-shift beds. It also included a desk and chair for the conductor. The caboose or caboose car was also a place to store shovels, brooms, wrenches, chains, couplers, lanterns, and other paraphernalia. It was basically a utilitarian add-on to a freight train. 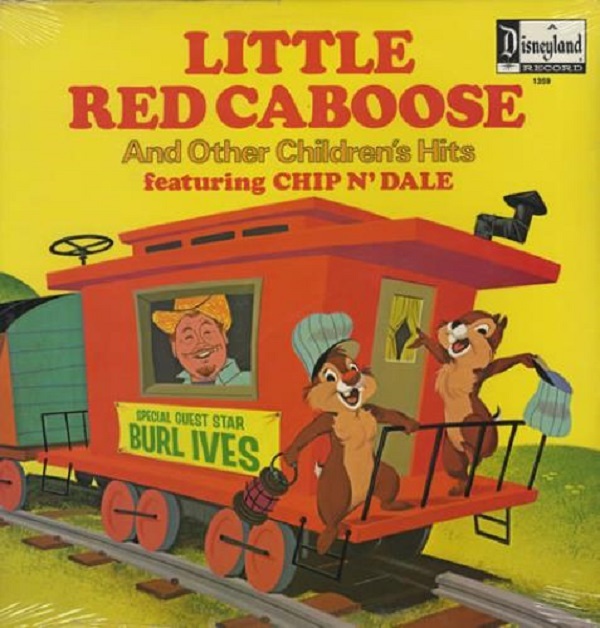 The cover of Chip N’ Dale/Burl Ives The Little Red Caboose and Other Children’s Hits, a 1973 album. A variety of cabooses appeared across the United States. Early on they were mostly modified boxcars and then custom four-wheel contraptions, many of which remained in service for decades. Later trunk carriers led the movement for eight-wheel or double-truck cabooses. A most distinctive change occurred in the 1860s, when the Chicago & North Western Railway introduced the cupola caboose, a feature that gave crew an excellent way to watch a moving train for any operational difficulties and gave it a most distinctive design. And in the early 1920s the Akron, Canton & Youngstown Railroad became the first to adopt the bay window caboose. It easily cleared overpasses and tunnels while still providing good crew visibility of the train. The penultimate design came with the extended-vision caboose, where the cupola was pushed out on both sides. Over time, too, largely wooden construction gave way to all-metal fabrication; tens of thousands of cabooses of all styles were built. 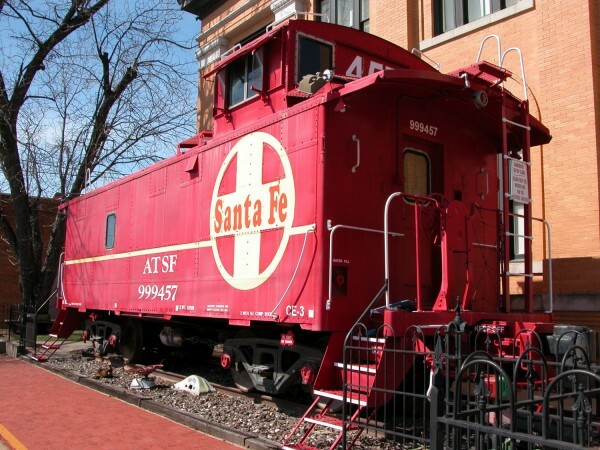 Santa Fe Caboose at the Layland Museum, Cleburne. 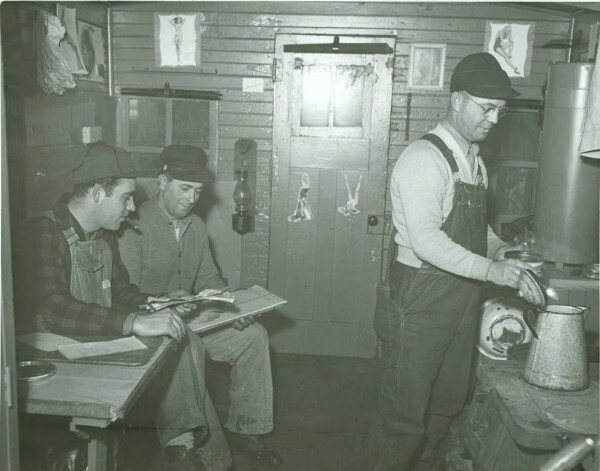 A conductor, flagman, and brakeman inside a caboose in 1948 in Allen County, Indiana. While red became the common caboose color because of its widespread usage on rolling stock and station structures, a railroad might select brown, yellow, or something else. In the 20th century, it was not unheard of to see multi-colored cabooses in combinations including red and white or some other paint combination. Never the less, red stands out as the color most associated with the caboose, being long remembered even after this equipment faded away. Since World War II, railroads have made monumental changes in their operations. The most obvious has been the diesel locomotive revolution. By the late 1950s, the iron horse had virtually disappeared. Companies also greatly increased the size of their freight equipment and added new types of rolling stock, such as the “Big John” hopper cars for grain haulage that appeared in the 1960s and specially designed flatcars for shipping containers first introduced in the 1980s. In the course of these transformations, state and federal regulatory changes and replacement technologies have spelled doom for the once ubiquitous caboose. 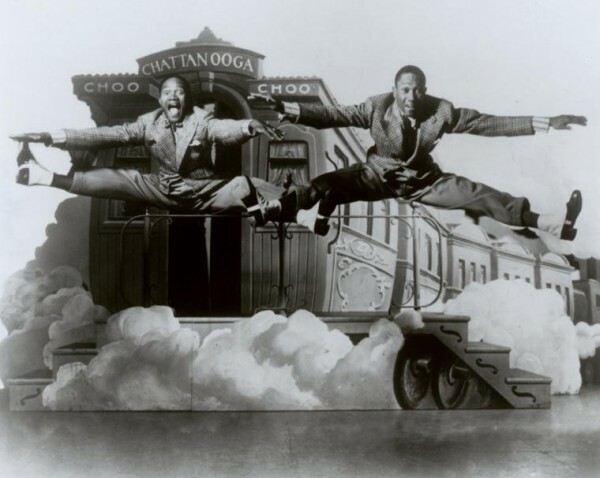 The Nicholas Brothers in side split leaps in front of a stage set featuring a railroad caboose labeled “Chatanooga Choo Choo,” 1941. In the 1980s legal requirements for having a “full” freight crew of five to six employees changed rapidly. Railroads began to negotiate successfully with their operating brotherhoods for work rules that allowed them to dispatch three and then two crew members, all of whom could comfortably ride in the locomotive. Equipment, too, became more dependable and did not demand the watchful eyes of “hind-end” crew members. A viable alternative to the caboose also appeared. This was the end-of-train device (EOT or EOTD). Placed on the rear coupler, it monitored air pressure in the brake system and reported any problems by radio signal to the locomotive cab. This portable electronic telemetry device also provided information about the slack between cars, and its blinking red light warned a following train that another one was is in front. Admittedly, this EOT’s light is somewhat less distinctive than the historic red and green caboose marker lights that evolved from kerosene to electric. 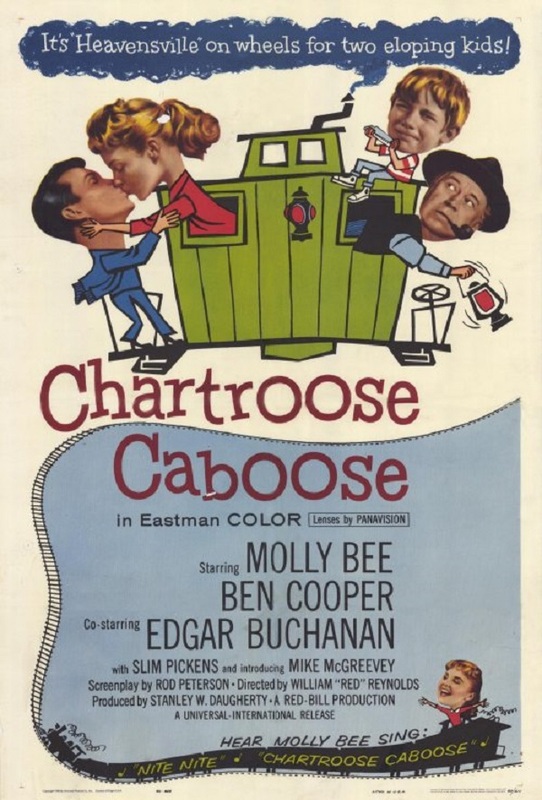 Poster for the 1960 film Chartroose Caboose. The last cabooses would be built in the 1980s; the premier manufacturer, International Car Company, ended its production in 1981. Soon railroads began to scrap, sell to rail enthusiasts, or donate to museums and communities these mostly obsolete pieces of equipment. Some carriers, however, continued to use cabooses, assigning them usually to switching or work-train chores. The demise of the caboose no longer allows train watchers the opportunity to anticipate the last car of a passing freight train. Children (and adults, too) once took joy in waving to crew members, and these usually friendly trainmen returned the gesture. There might be a trackside shout or two of “hello” or “goodbye.” Still, cabooses can be seen in both public and private places and ridden on at some operating railroad museums. 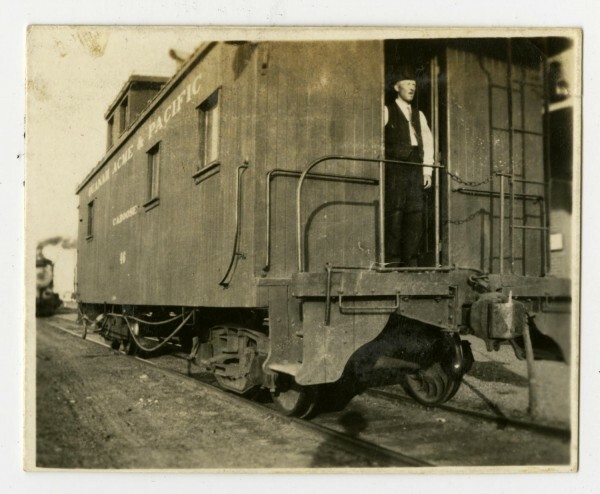 A conductor wearing a dark hat and vest stands in the doorway of a caboose labeled Quanah, Acme and Pacific Railway. A smoking locomotive can be seen in the background,1909. And the caboose’s iconic status endures in popular culture. Certainly “The Little Red Caboose Behind the Train” is still sung and enjoyed by present-day school children. Yet the reference to the caboose probably needs to be clarified by the teacher just as the one-room school must be explained. is a Kathryn and Calhoun Lemon Professor of History at Clemson University, is the author or editor of more than 30 books on railroads and transportation history. One recent book is Railroads and the American People, published by Indiana University Press. 1. California State Railroad Museum Library. 4. Dreanna L. Belden/University of North Texas Libraries, The Portal to Texas History. 5. Donald A. Weber/Allen County Public Library. 6. Jerome Robbins Dance Division, The New York Public Library Digital Collections. 8. Frontier Texas!/University of North Texas Libraries, The Portal to Texas History.